Albany Musicians' Association: Hire Live Music! We will be having our Fall general membership meeting on Monday, October 22 at the Zaloga Post of the American Legion. The meeting starts at 7:00, and there will be a free buffet with socializing and networking starting at 8:00. We’re trying the Zaloga Post for our meeting for a few reasons. The cost is less, there is a large parking lot, and it’s on Everett Road, right next to Exit 5 on I-90. You may remember it from our Local 14 anniversary event last November. We’ll have the same food and beverage, and we think it will be very nice. I hope you all can be there! 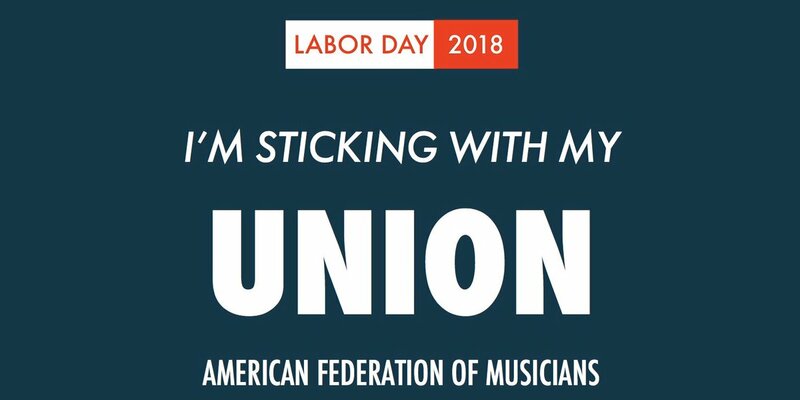 Our power and strength comes from musicians and other working people joining together. Let’s remember that on #LaborDay2018 & each day! Continue reading | Comments Off on Happy Labor Day! “Freedom’s just another word for nothin’ left to lose”. Those lyrics by Kris Kristofferson were made famous by the great, gravel-voiced Janis Joplin. On the Fourth of July, we might hum along, thinking about freedom and wondering at its costs and how much we could lose. The fuss over Michael Moore’s “Fahrenheit 9/11” makes the point. Moore’s film title was inspired by the sci-fi classic “Fahrenheit 451” in which Ray Bradbury described a future where art and books were banned and burned by a totalitarian government. Artists in that future responded by memorizing books, literally preserving them in their bodies. That old novel was far-fetched, as science fiction can be, but it made a point about the role that artists play in protecting our culture and society. To grasp the real life significance of artists as political agents, we have only to remember Cambodia, Russia, Czechoslovakia, and China. In those countries, as in Latin America, the first citizens sent to the Gulag or the “re-education camp” were the artists. It’s no coincidence that repressive governments go after poets, painters, and playwrights. The artistic sensibility and the practice of making art create a habit of asking questions and –– when a political structure is fragile –– one question and one artist can bring the whole thing down. In the United States, we don’t murder artists, but we do have culturally specific weapons for killing their work. We lower their status, minimize their contributions and cut their funding. We also belittle artists by suggesting that their opinions are irrelevant. It doesn’t make sense. We accord legitimacy to attorneys and professors, and we give business leaders airtime to posit their perspectives on current affairs, but we deny that access and that respect to those who have the most highly developed skill in sorting through rhetoric and images. Art provides contrast to the dominant messages of our culture so that we can clearly see them. We have a wonderful example nearby in the Berkshires. The much-loved American artist Norman Rockwell used his work to comment on civic, social and political issues. His paintings for The Saturday Evening Post and Look magazine covers raised provocative questions about the impact of war, religious intolerance, civil rights and poverty in America. Art concentrates thought and emotion. Artists see underlying truths and reflect them back to us. Think about the powerful depression-era photographs by James Agee and the more recent images of people living with addiction and AIDS shot by Cindy Sherman. Artists grab us by the front of our shirts and make us look. Right or wrong, pleasant or disturbing, they make us think. And it is thinking that is at the center of, and the true requirement for, citizenship in a democracy. Artists ask us to see what it is and to imagine what might be. On this day when we consider those things that preserve our freedom –– the laws and the wars, the courts and the candidates –-we might forget that art, too, is part of the freedom process. So, if for you freedom isn’t just another word for nothing left to lose, then be sure to thank an artist today. Diane Cameron is a Capital Region writer. DianeOCameron@gmail.com. This column was published by the Times Union on July 4, 2004 and used with permission of the author. The next general membership meeting will be on Monday, June 4th at The Orchard Tavern in Albany. The meeting starts at 7:00 PM with a free buffet and socializing/networking at 8:00. See you then! Congratulations to the students who were selected this year! Nicholas Cointois, a tenor vocalist from Shaker High School. He plans to major in musical theater at Westminster Choir College in the Fall. Olivia Lopez, a mezzo soprano from Columbia High School. She also plans to major in musical theater at NYU in the Fall. Oz McClamrock, a saxophone player from Troy High School. He will be attending McGill University to study jazz performance in the Fall. Local 14 of the AFM announces the Tommy Ippolito Music Scholarship 2018 Application. The application deadline is April 24, 2018. Please visit our Scholarship Page for additional information. This Scholarship is named in recognition of Thomas (Tommy) Ippolito as a tribute to his exceptionally gifted and accomplished musicianship and long-time leadership and service to Local 14 to promote music in the Capital Region. © 2019 American Federation of Musicians, Local 14—All Rights Reserved.